Elevate your date and let your inner adrenaline junkie out. There’s no need to get your passport ready to hop on a flight to Costa Rica; here are 6 places to go zip lining in Central Florida, all within 90 minutes of Orlando! At ZOOm Air at the Central Florida Zoo, you can zip your way through the Uplands course ($33.95) and complete 1.5 hours of fun with 30 game elements, 4 of which are zip lines. If you’re feeling more adventurous, go ahead and purchase the Uplands & Rainforest combo ticket for an extra hour of challenging fun ($54.95 total). Be ready to face 30 MORE game elements and 5 more zip lines, ending with a 500′ zip line with a starting height of 50′ above the ground. The Rainforest adventure can only be done after completing Uplands on the same day. If you complete Uplands and want more adventure but don’t quite want to commit to another hour of challenging fun, you can add Big Zips to your Uplands adventure. Big Zips gives you the ability to do the same 500′ zip line (plus two extra ziplines) in the Rainforest excursion, but only 3 of the 30 game elements. The upgrade costs $14.95 and only 20 minutes of your time. An aerial park filled with oodles of obstacles and challenges, Orlando Tree Trek Adventure Park features four obstacle courses, each one gradually increasing in height and challenge level. Set on over seven acres of natural pines, this adventure park will have you zipping, climbing, balancing and leaping all afternoon. The zip line highlight of the park is the giant 425-foot zip line located in the adult course. Including brief training session, the course will take you around 2-3 hours to complete. Admission is $49.95 for adults. The Screamin’ Gator Zip Line at Gatorland will take you along 1,200 feet of high flying, heart pounding adventure from some of the finest zip line towers in the world. Standing over seven stories tall, these amazing towers feature multilevel launch pads and breathtaking views from high above the treetops. Plus, you’ll be zipping right over the alligator enclosures. How’s that for adrenaline-fueled fun? The zip line course ends in a side-by-side dual zip line where you can race your sweetie to the finish line. The cost for this 2-hour experience is $69.99 and includes all day admission to Gatorland. The Brevard Zoo is not just home to some awesome wildlife; it’s also where you’ll find Treetop Trek Aerial Adventures. Beginners can enjoy the Canopy Walk ($29.95) which includes 21 elements and 2 zip lines 20 feet above ground. Seeking more thrills? The Challenge Reloaded ($49.95) includes everything in the Canopy Walk plus additional challenges and thrills. 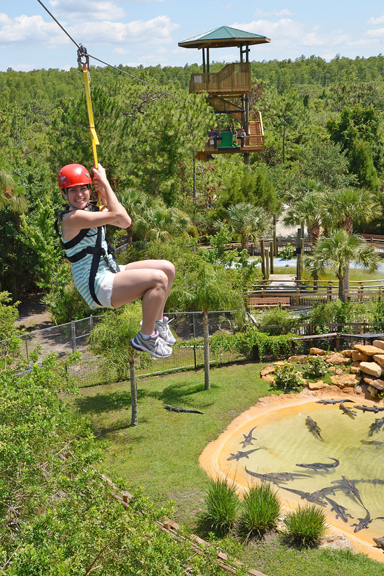 At 40 feet above ground with 600 feet of ziplining, you’ll zip over the wetlands and past the gators. This course features a total of 35 game elements and 14 ziplines and will take anywhere from 2.5-3 hours to complete. The Black Diamond Challenge ($64.95), which includes everything in the Challenge Reloaded, kicks it up a notch with even more challenges added. If you’re pressed for time but want the thrills, you can do the Zip Only ($39.95) which will take you on 9 zips around the zoo with heights of up to 50 feet above ground. Reservations are not required but advised. Located in St. Cloud, Forever Florida has more adventure than you’d expect to find in a town of only 40,000 people. Their Zip line Adventure ($79.99) includes 7 zip lines and 3 sky bridges and is led by an expert guide. Their longest zip line is 682 feet long and reaches speeds of 30mph. If you’re a real thrill seeker, check out their Thrill Pack ($69.99), which includes their Rattlesnake Zip line Roller Coaster, a (safe) jump off a 7-story platform during the Panther Pounce, and their Peregrine Plunge, a zip line race with a starting height of 78 feet and a distance of 1,300 feet of zipping! Take things to the next level with the Night Flight Adventure ($89.99). During this evening excursion, you’ll complete the entire Zip Line Adventure course in total darkness, observing the starry sky above and active wildlife below. Located in Ocala, this outfit offers 2.5-3 hours of adrenaline-pumping fun with their Full Tour ($96) where you’ll enjoy 9 zip lines, 2 rope bridges, and a rappel. An Express Tour is also offered ($59), which will give you the opportunity to experience 5 of the zip lines and 1 rope bridge. You can even visit for a nighttime zip line ($59). Read our previous review of this experience. There are four more zip line adventures to experiences west of Orlando in the Tampa area. Check out all the details from our sister site, Tampa Bay Date Night Guide, here: tampabaydatenightguide.com/couples-ziplining-dates-tampabay. The Canyons is definitely the most amazing place I’ve ever zipped! Thanks for the recommendation! I would like to advertise with your site!